In 1967 at the height of the Vietnam War, the Australian government, led by Harold Holt, agreed it would be a good idea if the national football team took part in a tournament in Vietnam to boost morale in some of the nations involved in the war. Football diplomacy in Asia preceded ping pong diplomacy by a few years. So Australia set off for the Vietnam National Day Soccer Tournament in Saigon at the start of November 1967. ‘Uncle Joe’ Vlasits was appointed coach in succession to Dr Joe Venglos who had returned to Europe. Vlasits took a young group of players, eight of whom went on to be part of the squads which helped Australian qualify for the World Cup in Germany in 1974. In many ways it was a strange and frightening experience for the Australians being pitched into the middle of an ongoing war which was beginning to become unpopular at home. As Johnny Warren remembers, the team would be eating with soldiers in their mess and then going to play football, while their colleagues went off to fight. Players were warned by security on arrival not to spend time with Americans, because the latter were prime targets for the Viet Cong. Eight teams from nations involved in the war took part. Australia, South Vietnam, New Zealand and Singapore made up Group A and South Korea, Malaysia, Thailand and Hong Kong were in Group B. The first match was against New Zealand on 5 November at Cong Hoa Stadium and the Socceroos won by five-goals to three. Atti Abonyi scored a hat-trick and Johnny Warren, the skipper, and Ray Baartz scored the others. Roger Romanowicz was in goals ahead of the more experienced Ron Corry and Frank Micic started in central defence. The latter was replaced at half-time as the pitch was a quagmire which did not suit Micic’s skills. The tough, nuggety Manfred Schaefer took over. Luckily all the fireworks that day were on the pitch. In the next game two days later Australia took on the host team, which was buoyed by a visit from the South Vietnamese Vice-President to their change rooms at half time, with an offer of a big reward for victory. Johnny Warren scored the only goal of the game after 35 minutes and ran himself into exhaustion for the team. That left a third match against Singapore which was won comfortably by five goals to one. The Australian scorers were identical to those in the first match—three to Abonyi, and one each to Warren and Baartz. The semi-final against Malaysia turned out to be the toughest yet with a brawl on the pitch after a Malaysian player kicked out at Tommy McColl and the police and military had to come on to the field to restore order. The match went into extra time and there were only three minutes left to play when Ray Baartz scored the goal which won the game. In the final Australia came up against South Korea on 14 November. The match nearly did not take place after the team was informed that there was no space in the stadium for the Australian military personnel who had been a huge support to the players on and off the field. The Australians threatened not to take part. As it turned out the service personnel were allowed in and the rest of the crowd supported Australia rather than the Koreans, much to the Aussies’ surprise. South Korea scored in the first minute but the Australians responded brilliantly. Billy Vojtek produced a wonderful solo goal after 36 minutes and Abonyi and Warren added the others in a three-two win and the first international tournament victory for the Socceroos. Though mortar batteries could be heard in Saigon on most days, it was said at the time that there were so many Vietcong at the matches that there was no trouble at the Cong Hua stadium! John Barclay, the tour manager, told the team he had put his head on the block for them. He overturned an Australian Soccer Federation decision that the team should return their official track suits at the conclusion of the tour! Talk about playing for the jerseys. John Warren wrote in his autobiography that the players received $50 a week while on tour plus $10 as an allowance. The contrast with modern times is striking, even allowing for changes in the value of money. The day after the victory the Australians went off to visit the troops in Vung Tau and played a game against them and then there were matches with Indonesia and New Zealand again in Malaysia on the way home. The Socceroos played ten games on that tour and won them all. The camaraderie in the face of adversity was an important element in the mind-set which eventually helped the Australians to qualify for the World Cup in 1974. 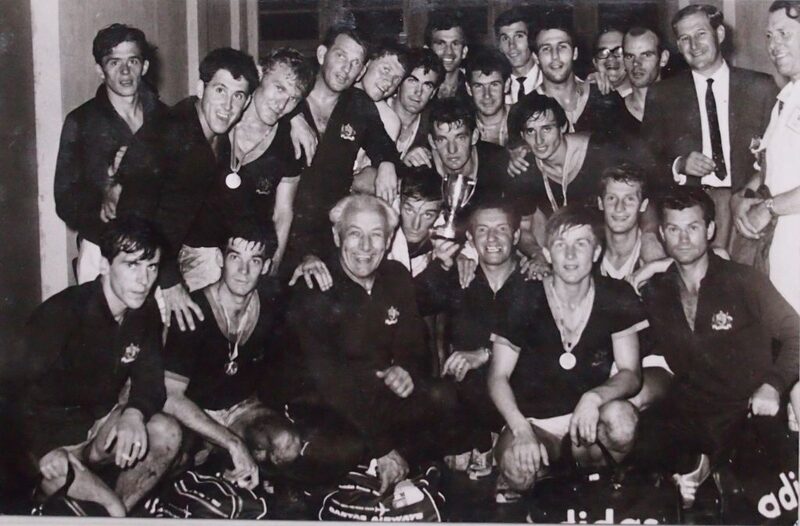 The Socceroos with their medals after having won the Vietnam tournament in 1967, standing from left: Attila Abonyi, Ray Richards, Manfred Schaefer, Dr Brian Corrigan, Roger Romanowicz, Gary Wilkins, Frank Micic (rear), Ray Baartz (crouching), Stan Ackerley (peaking through). Ron Corry, John Watkiss, Billy Vojtek (leaning forward), Ray Lloyd, Terry Smith (reporter), George Keith, Jim Connell (manager), Martin Royal (ABC reporter). Front: Tommy McColl, Johnny Warren, Lou Lazzari (masseur), Joe Vlasits (coach). Alan Westwater, Ted De Lyster, Tony Boskovic (referee). Don Woolford of AAP also covered the tour. Nick Pantelis was selected, but had not yet been naturalised and was unable to travel. *The name Socceroos was not used until after the team came home. The first time it was used was in 1972. Thanks Mark. The full story is in Roy Hay, Football and War: Australia and Vietnam 1967-1972: A Missing Part of the National Narrative, Sports and Editorial Services Australia, Bannockburn, 2016. The book covers the return trips in 1970 and 1972 as well, all while the war was still going on. Looking back it becomes more difficult to explain why the governments of the day allowed/encouraged this to happen and why these pioneers have not been recognised. I just watched the film about the Sapphires from Cummeragunja the other night, who did become part of the national story. There is a function for the 1967 survivors at the Sydney Cricket Ground Trust next Tuesday, which is some recognition at last. Apparently it was one occasion when a conservative govt & PM Holt believed, contrary to the usual default line, that politics & sport DOES mix! That’s what I believe, though it is hard to prove it, since the file that covered the cabinet discussions on the matter was never transferred to the national archives and is now claimed to be lost. I even had Malcolm Fraser on his hands and knees trying to find out if there was anything in his archives about the decisions. He was Minister for the Army at the time. The previous trip to Cambodia in 1965 for the first attempt at World Cup qualification opened the eyes of the Australian Ambassador in Phnom Penh. According to Lou Gautier in Soccer World the visit by the Australian soccer team was worth at least £100 million in foreign aid to Australia. ‘A rugby follower himself, he told me that he had never been aware Australia had possessed such a powerful propaganda and good will weapon as its soccer team’. Great digging, as usual. I understand it was pretty common for many members of national teams in Asia to be part of the army as well. Any possibility that some of the Sth Vietnam team were actually Vietcong? The Australians thought that the conditions they faced were tough, but those who had seen what the South Vietnamese team’s conditions were like realised that they were far, far worse. Some if not all of them, were subject to military discipline. So the effect of the promise of largesse (VN$50,000 each according to one contemporary report) by Air Vice Marshall Ky at half time in the game against the Australians if they won the game may have been treated by them with some scepticism. I wish there was some evidence about how they reacted, but I have not come across any so far, apart from the fact that they camped in the Australian half for long periods after half time and they fought the game out to the end. Did it turn any of them into supporters of the Viet Cong? I doubt it, but I don’t know.